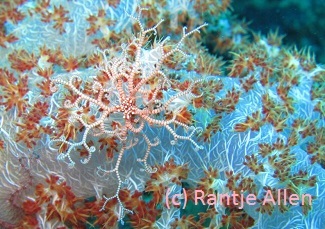 Basket stars can be observed on night dives in Gorontalo. Basket stars are beautiful marine invertebrates. Starfish and brittle stars are their distant relatives. They have a central disk and arms branching from it. The arms are many times the diameter of the central disk, which looks small in comparison. The number of arms is hard to count because each arm has countless tendrils. These tendrils are the main identifying feature of basket stars. They also possess radial symmetry. These features give them immense beauty and balance. Basket stars sleep during the day. They curl under corals and hide in crevices. Notice the baby basket star in the picture. It is hiding among the branches of a Dendronephthya soft coral. After the reef becomes dark, basket stars climb on top of a hard coral to search for the current. They extend their arms and tendrils into the current, waiting ensnare some small organism. They eat plankton, worms and tiny fish. Something that drifts in the current and touches a tendril will be quickly ensnared. The basket star will grip its prey tightly and then secrete mucous that helps to immobilize its dinner. A basket star feeds itself by putting the prey directly into its mouth. The mouth is like a comb that extracts the food. Then it pulls its arm and tendrils back out of its mouth. The mouth is located beneath the central disk. Miguel’s Diving provides advice on current diving. Watching basket stars during a night dive is fascinating. Notice in the video how delicate are the movements of the tendrils and arms. 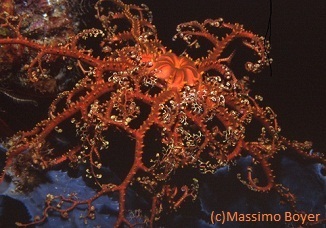 With so many arms to use, basket stars can move rather quickly. 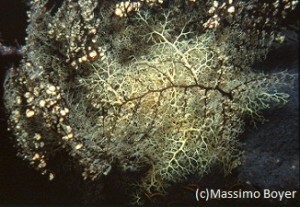 Miguel’s Diving staff typically finds three species of basket stars on a night dive. The most common ones are white (Astroboa nuda). Occasionally, divers will spot a black one (Astroboa granulatus). In recent years, two new species of shrimps living on Astroboa basket stars have been described from the Moluccas. The second most common basket star found here is actually an undescribed species. Because of its beautiful color, we affectionately call it the Orange Heart Basket Star. For your chance to observe these beautiful creatures for yourself, please book your dive trip with us.